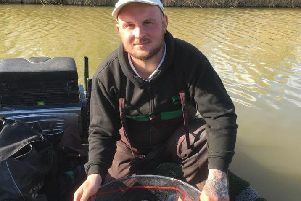 Another Whittlesey win for ace angler John Taylor. A late change of venue from those running the Whittlesey AA matches onto the Twenty Foot Drain turned out to be an inspired move as it produced one of the best results of the season. With the fish in a feeding mood John Taylor was always going to be the man to beat and with a fine 31lb 7oz weight he proved to be much too strong for the chasing pack. He fished a short whip with pinkie and maggot over groundbait, taking roach, rudd, perch and skimmers. In second place was match organiser Jeff Tuttlebee with a similar catch predominantely on the waggler and red maggot for 13lb 15oz, followed by Mike Mohan with a tench and a good net of smaller fish for 13lb 9oz. After no matches for several days down on the Decoy Lakes complex, there were open matches and JVAC also got a fixture in just before the holiday break. They were on the Six Island Pool and it was Andy Gausden in pole position putting a very respectable 76lb to the scales. After fishing around his peg in the first hour with little to show for his efforts he decided to concentrate on a long pole line with red maggot and by the end of the match he had more than enough to top a small but strong field from peg 6. Runner up was Ian Frith who alternated between a long pole line and the margins for 65lb 4oz from peg 13, and then came Perry Briggs with 51lb 10oz from peg 24. He caught on the pole with pinkie. In the Decoy Over 55s match, Chris Saunders drew hot peg 6 and proceeded to take first place with 53lb 11oz, a net of carp, F1s and a few roach taken on the pole with soft pellet and red maggot. In second place from peg 17 was Jay Richardson who fished similar tactics to the winner. Gordon Parker came in third. He fished a small lead over to the island for 48lb 2oz. The Weekend Decoy Open match was fished on the Damson Pool, not everyone’s first choice of the lakes on the Decoy Complex, but it does produce some very good leading weights and has to be worth a try at least through the winter months judging by the fine weights recorded. Leading the way with a huge 144lb 4oz net of small carp was Nigel Baxter, who caught on the pole with soft pellet and maggot. Dave Thornton came second with 94lb 15oz, followed by Graham West on 92lb 6oz. You will be hard pressed to beat those sort of weights right across the country at the moment. At Ramsey St Mary’s: 1 - Andrew Wilding , 18lb 15oz, 2 Keith Rayment, 12lb 10oz, 3 Ken Taylor, 9lb 1oz. At Factory Bank: 1 Stu Cheetham 23lb 14oz, 2 Peter Sterry 16lb 15oz, 3 Andrew Wilding 16lb 3oz.